Our goal has always been to serve as a personal advocate on behalf of our clients — to be the one advisor they trust to assess the whole picture carefully and then deliver smart, customized financial advice that is comprehensive, unbiased, and objective. 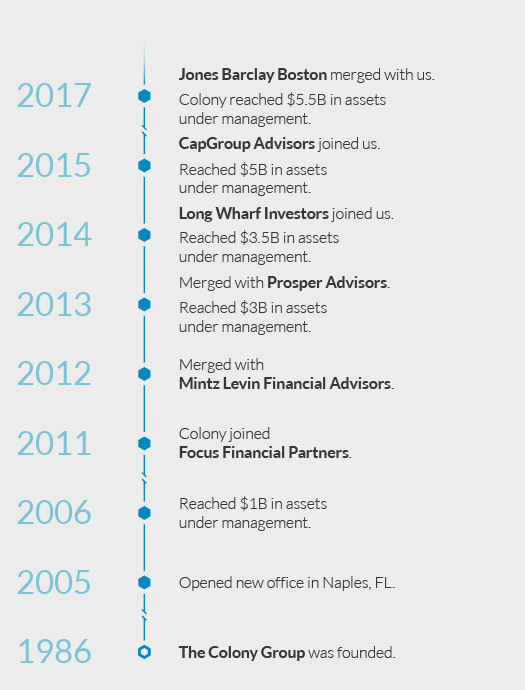 With offices across the country, The Colony Group is an independent wealth management firm with several billion dollars in assets under management. We were founded in 1986 with a focus on providing high-net-worth individuals and families with fiduciary, fee-only wealth management services of the highest caliber. Through the years, our firm has grown substantially, attracting individual, corporate, and institutional clients alike. Our growth is guided by purpose. The Colony Group’s mission is to provide peace of mind to our clients through objective wealth management and investment advisory services delivered by a team of trusted experts dedicated to the highest level of personalized service. We selectively merge with other firms that share our belief in putting client interests first, enabling us to extend our services to a broader cross-section of individuals, corporations, and institutions. In 2012, for example, Mintz Levin Financial Advisors, another successful and respected Boston-based wealth advisory firm, merged with us. It was an unprecedented move for both Colony and Mintz, bringing even greater value, capabilities, and resources to our clients. Our team was further strengthened and geographically diversified when Prosper Advisors merged with us in 2013. Prosper shared our approach to professional excellence and outstanding client service, and it also offered Colony a well-established presence in the New York metro area. 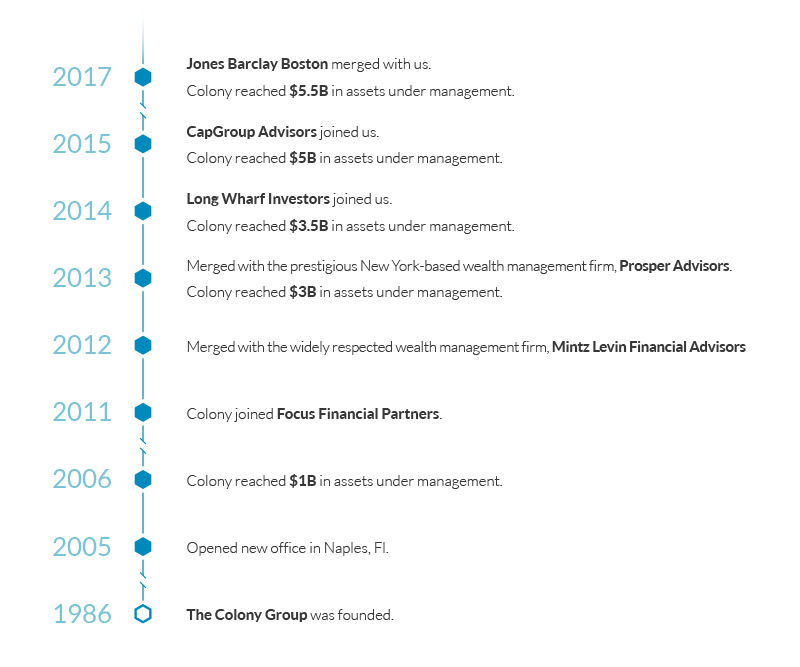 In 2014, the former independent Registered Investment Advisor, Long Wharf Investors, joined The Colony Group, bringing additional talent and client assets to the team. In 2015, Virginia-based CapGroup Advisors merged with us, further expanding our expertise in the institutional consulting and private client markets while extending our footprint along the East Coast. This merger improved our ability to serve large and middle-market institutions, and our financial counselors and investment management professionals can now provide even more support to private clients in the mid-Atlantic region. We expanded our geographical presence west in 2017, when Denver-based Jones Barclay Boston merged with us, bringing deep and tenured expertise managing the wealth of active and retired professional athletes. This merger allowed us to launch what we believe will be a best-in-class professional athlete and entertainment practice. Facilitating the sharing of best practices by industry experts. Grooming internal talent and recruiting for succession planning. Offering access to resources, as well as operational and technology efficiencies. Broaden your perspective by sampling some of our latest thinking on a wide range of timely topics. Discover how the deep and varied expertise of our team can support your journey.